Monday Night Quick Dose of Cute: Smile! The Daily Donkey 136: Smile Two! Three weeks, five cuttings, several gallons of ice water, 695 bales of hay neatly stacked in the pole barn. It's definitely a record. The entire hayfield has been cut, except for the sloped section you can see above where the grass was too thin to bother. During several of the past years we weren't, for various reasons, even able to get the whole hayfield cut. In better years we would have ended up with a lot more than 695 bales, but at least these all look pretty good. We're still 205 bales shy of our 900 bale goal, so the plan—weather and everything else permitting—is to re-cut some of the hayfield in three or four weeks, once the summer grass is taller but before it starts to go to seed and/or burn up. We don't usually do this, but we're hopeful it'll work out. 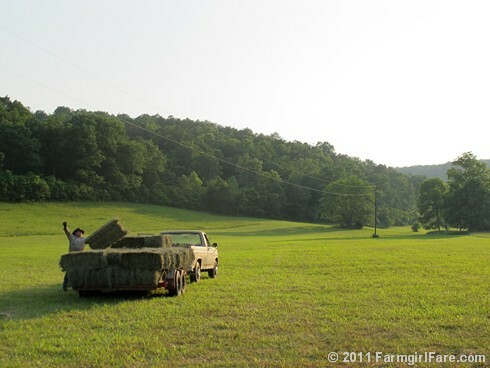 More about haying below. 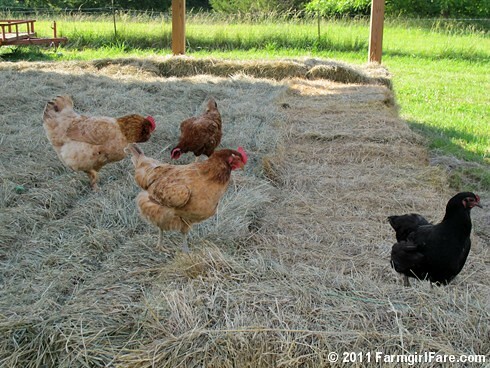 . .
© FarmgirlFare.com, getting ready to hit the hay before picking up more hay bales tomorrow. Hooves crossed the chance of rain they just put in the forecast for tomorrow afternoon doesn't happen! 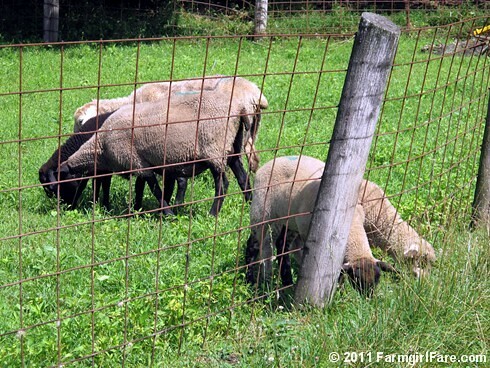 Grazing in the recently cut hayfield with their livestock guardian dogs. © FarmgirlFare.com, where sometimes you really need a visual reminder on those days that feel anything but peaceful—no matter who you are or where you live. I certainly needed one today. And of course those sneaky sheep aren't actually supposed to be out in the hayfield, but let's just ignore that part, okay? Lots more photos below. . .
To all the Big Daddys out there! 2/13/11: One of Those Times. 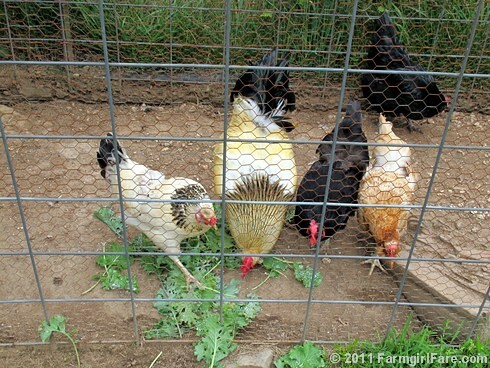 . .
© FarmgirlFare.com, where Mother Nature rules farm life, and the entire week's plan can change in the blink of an eye—or with one click on the weather site. 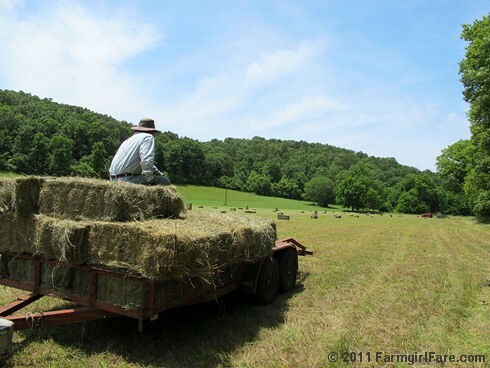 Due to the newly predicted rain in this morning's forecast (which hasn't yet shown up), today's scheduled hay cutting has been postponed—tentatively—until Wednesday. We didn't want to take the chance on the hay getting wet, and while our minds would like to get this project finished, our sore bodies are fine with the delay, especially since it's supposed to be a whole lot cooler by then. Always adapt, always eat well, that's what we say! 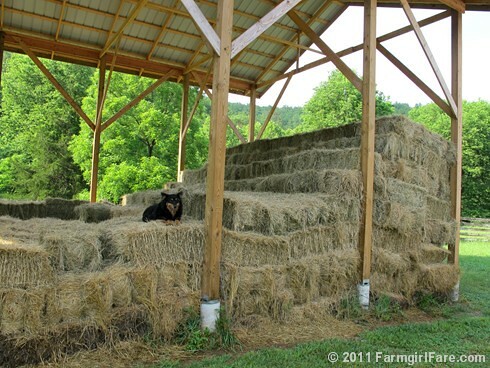 We added another 105 bales of hay to our ever growing stack in the barn, which, after five cuttings (including one small test cutting back in May where we only got two dozen bales instead of the expected 50 to 60) brings us to a total of 550. Good, but still quite a ways from our goal of 900. We had hoped to take a few days off from the hayfield before cutting again, but the weather forecast says hot, hot, hot, now, now, now, followed by rain (yay) and then, finally, a break in the relentless heat (double yay), so it's now or quite possibly never. If all goes well, Joe will be cutting the last big section of the hayfield tomorrow, and on Monday we'll be back out picking up bales. That won't get us to 900, so the plan is to re-cut some of the hayfield later in the summer, once the warm weather grass gets thick and tall enough. Our climate and grasses don't normally lend themselves to double cuttings, but everything about this haying season has been a little different than usual, so we're hopeful that it will all work out. 6/11/11: Jump Down, Turn Around. . .
© FarmgirlFare.com, where you know it was going to happen eventually. Turns out today's Daily Donkey is suspiciously similar to a photo some of you may remember from back in December 2009 (though it isn't actually the same one). I'm blaming my heat melted brain—but still love it the second time around. 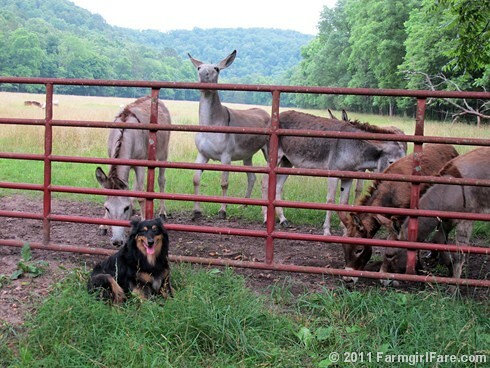 Life on this farm revolves around treats. You'll find visible proof here and here. 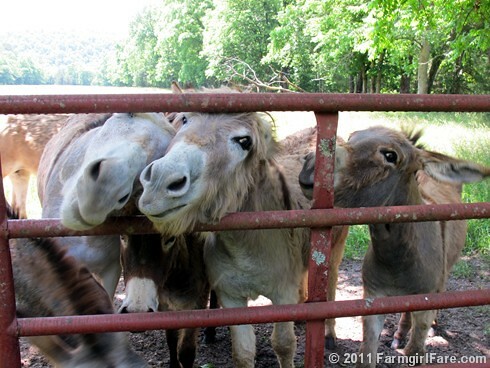 © FarmgirlFare.com, where you can probably tell why it's so easy to overfeed your donkey. Who can resist? Did you know that if you space your onions two inches apart rather than four when planting them in the garden, you'll be able to enjoy homegrown scallions and spring onions (which are simply young onions) with very little extra effort, and without taking up any extra space? That's my kind of gardening. 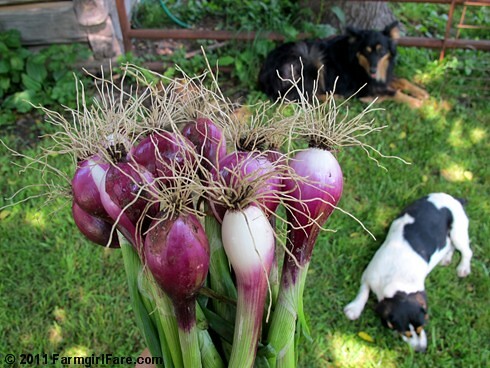 For more about growing onions, check out this post on In My Kitchen Garden, Growing Onions from Purchased Plants - Ordering and Planning, which also includes links to my other onion posts. This spring I planted about 240 little purchased onion plants, and we've been scarfing up scallions for weeks. Thanks to all of you who offered up ideas for What To Do with 125 Scallions and Your Recipes and Favorite Ways to Use Green Onions back in 2008, I have all sorts of green onion inspiration. More photos and recipe ideas below. . .
Want to see more of Mr. Midnight? He's here. And the turtles? 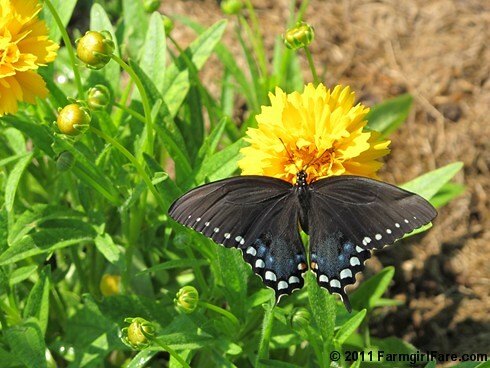 They're here—and everywhere this time of year! 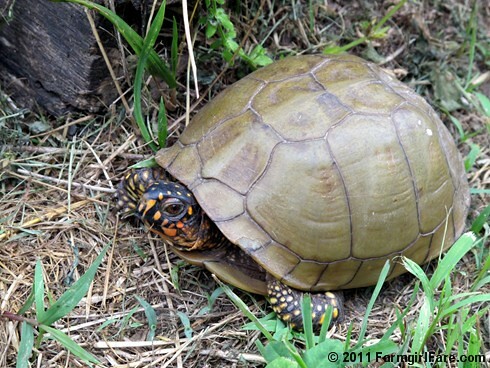 © FarmgirlFare.com, where the only good thing about not having any strawberries in my kitchen garden this year is that I don't have to fight the turtles for them—and I'm sure that's exactly what this one was searching for. 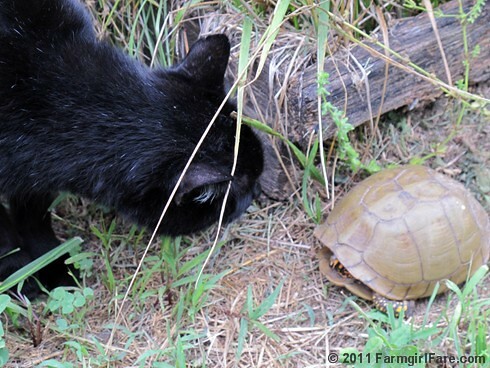 I love turtles, but a girl's gotta draw the line somewhere. Though it doesn't seem like 445 bales—but it feels like 445 bales. The Daily Donkey 126: Hey, Who Put this Creek Here? 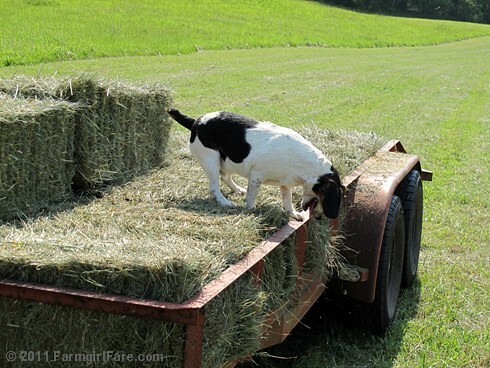 © FarmgirlFare.com, where the chickens and dogs like to play in the hay, and apparently beagle pup Bert loves the way his little bark echoes big when he's standing way up on top of the stack. Yesterday he let it rip and scared Joe half to death. Saturday Dose of Cute: Jump Down, Turn Around. . .
More photos and a hay report below. . . 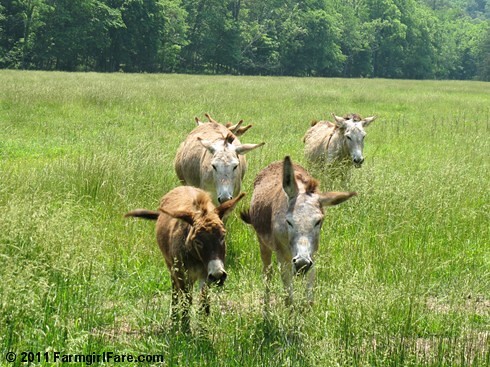 It's been a little buggy in Donkeyland. © FarmgirlFare.com, hoofing it out in the hayfield late into the evening. (That would be me and Joe, not the longears.) Goodnight! Zzzzzzzzz. 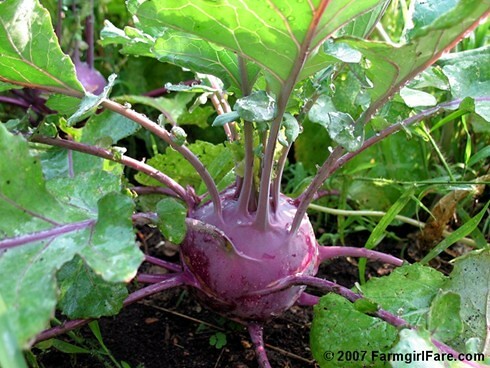 Kohlrabi, from the German words kohl (cabbage) and rabi (turnip), is not actually a cabbage or a turnip. Cultivated in Europe since at least the mid 1500's, this cold loving member of the brassica (cabbage) family is low in calories, high in fiber, and a good source of several vitamins and minerals. Although kohlrabi has been grown the U.S. since at least the early 1800's, it still has yet to become very popular. Sweet and mildly flavored, kohlrabi can be braised, boiled, stuffed, sliced, scalloped, steamed, julienned, roasted, and sautéed. You can grate it into slaw, toss it into salads, slip it into soups and stews, snack on it raw with dip, and stir-fry it. You can even wrap it in foil and grill it. I've seen recipes where kohlrabi was covered in cream, sautéed with anchovies, stuffed into empanadas, fried into cakes, served with hollandaise sauce, and turned into a cinnamon brunch bake. This vegetable is versatile. Unfortunately all of these cooks are wasting their time—and their kohlrabi. For in my opinion, the only thing you should ever be doing with kohlrabi is turning it into purée. Trust me. This simple kohlrabi purée makes use of both the bulbs and the leaves, though if you don't have any kohlrabi leaves, I'm thinking you could probably substitute some kale instead. It's adapted from The New Basics (one of my very favorite cookbooks), and has been one of my most popular recipes since I posted it back in 2007. Kohlrabi purée, which has a consistency similar to mashed potatoes (and makes a good low carb substitute), isn't very pretty, but this is actually good news because that means you can skip serving it to guests and gobble it all up yourself. I can't stop eating the stuff. Unfortunately kohlrabi hasn't found its way to rural Missouri, possibly because this cool season vegetable doesn't care for our drastic late winter and early spring temperature fluctuations. I've sown kohlrabi seeds in my kitchen garden many times during the last 17 years, and I've only ended up with a few harvests. You can read more about my experiences growing kohlrabi (with other gardeners chiming in in the comments section) here. I definitely haven't given up on growing kohlrabi, though. It's the only way I'll be able to make more purée. Do you have a favorite way to cook or eat kohlrabi? Do you grow kohlrabi in your garden? 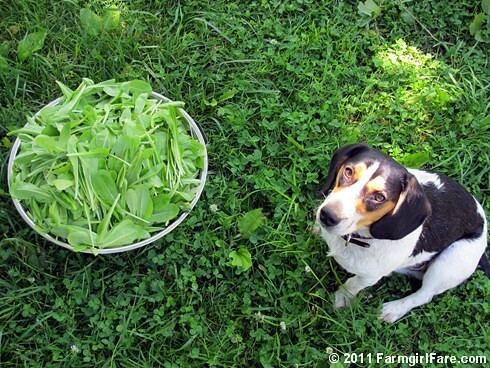 © FarmgirlFare.com, crunchy in the garden, smooth in the kitchen—and ever hopeful for another bountiful harvest. But I don't wanna have salad for the next 15 days in a row. I'll probably die if I eat that much lettuce. 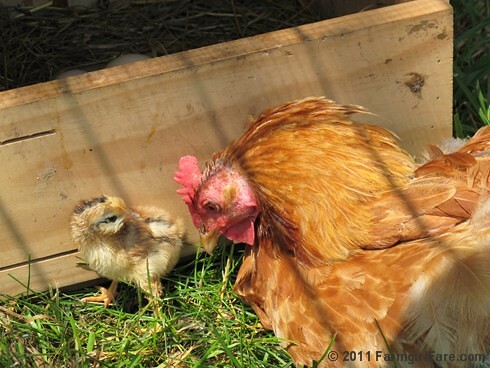 © FarmgirlFare.com, where the current baby chick count still stands at one, but we're all hoping one of the other three broody hens will soon hatch out a pal for this lone little peeper. And the mama's head (along with the rest of her) looks a little strange right now because she's in the middle of molting, which is the natural process of losing and regrowing feathers. © FarmgirlFare.com, where there are now 144 more bales of hay stacked neatly in the pole barn, and we are both still able to move—although that may change by tomorrow morning. Only about 625 bales (hopefully) more to go! More photos and the story below. 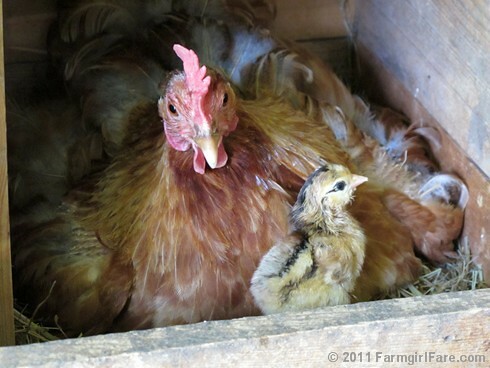 . .
Sunday Surprise Dose of Cute: Peep! Joe and I have been using cool little two-way radios for years to keep in contact with each other around the farm. A few minutes ago, I stepped inside one of the chicken coops to give Whitey and her five cohorts (yes, 11-year-old Whitey is still alive!) some steak and lettuce scraps, and immediately pressed the talk button. We've had lots of baby chicks hatch since Whitey started things off back in 2007, but I still get excited over every one. Several of our hens are sitting on nests of eggs right now, so hopefully this little cutie pie will be hopping around with some friends real soon. In the meantime, I'm off to build a new place for mama and the kid to live! 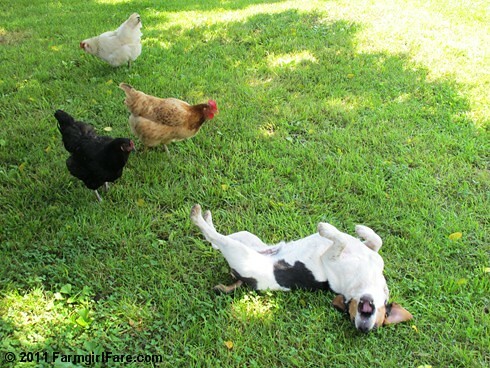 © FarmgirlFare.com, where sometimes you just have to stop everything and squeal peep with delight. 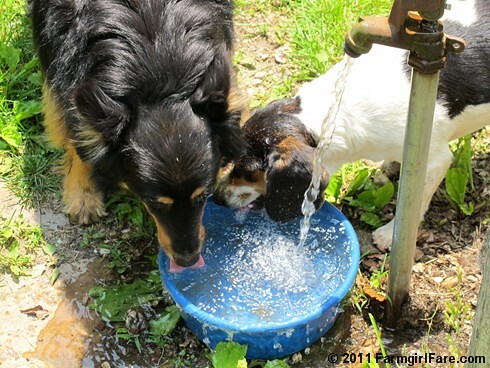 © FarmgirlFare.com, where we're cooling off any way we can—and relish is always optional. Wow. Six years. 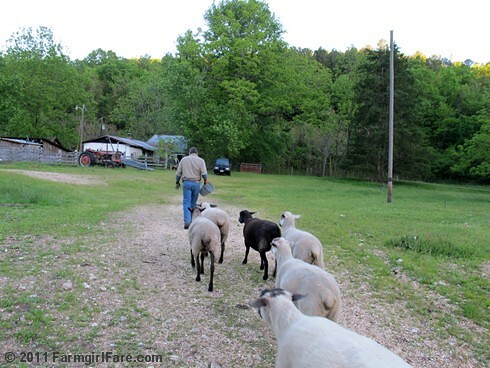 It's hard to believe it's been that long already, yet at the same time, it's hard for me to remember what life was like during the five years I lived on this farm before I started blogging—and carrying my camera everywhere. This is my 2,038th post. There are another 297 posts on In My Kitchen Garden. The Daily Doses of Cute (which are almost appearing daily!) have passed the 500 mark. I've taken tens of thousands of photos and am now on my fourth digital camera, which still spends nearly all of its time on the auto setting. I finally have a Recipe Index. And an About page. And a FAFQs page. And so many donkey photos (and donkeys!) that in February I started The Daily Donkey. In the past six years, my two little blogs have had over four million visitors. 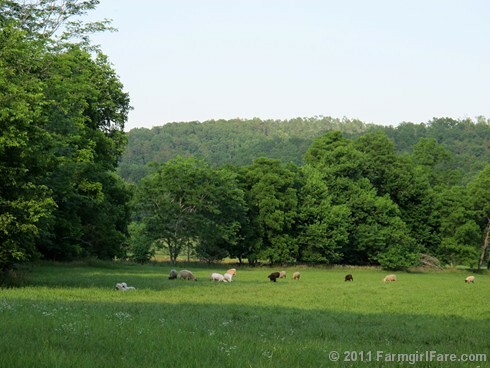 I titled my very first Farmgirl Fare post An Unexpected Beginning, and I had no idea how true that would turn out to be. In it, I mention that I looked up the word unexpected in my thesaurus and this is what it said: surprising, unforeseen, sudden, stunning, eye-opening, astonishing, astounding, amazing, breathtaking. When I posted the 100th Daily Farm Photo on September 18th, 2005 (which is still one of my favorites), I looked up the word amazing: astonishing, fascinating, stunning, shocking, wonderful, surprising, bewildering, prodigious, awesome, unbelievable, astounding, incredible, marvelous. My life has changed in so many unexpected and amazing ways during the past six years. I'm grateful to all of you for choosing to spend time here, and for your comments and feedback and kind words. I know some of you have been around since the beginning! I'm grateful to the sponsors who choose to advertise on my blogs, and to the BlogHer Publishing Network for helping to make that happen. Every little bit helps, and your support really makes a difference. It allows me to spend 30 to 40+ hours a week blogging. It allows me to spend more time taking pictures, telling stories, creating recipes, and meeting people around the world. It allows me to work at something I love doing. It also helps keep the farm going. Here's to another six years! 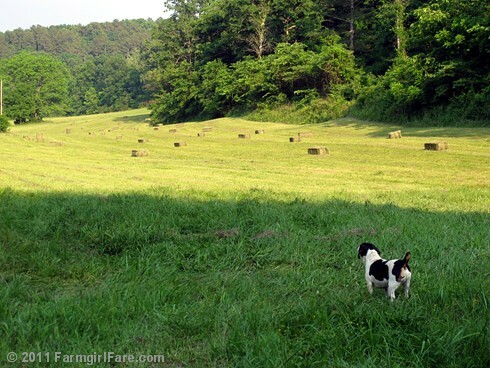 I'd love to stay and reminisce, but I have to go out in the blazing heat and help pick up hay. * Thanks to Lorna for asking if she can start shopping through a Farmgirl Fare amazon link and then purchase items already on her amazon wish list. Yes! As long as they aren't already in your shopping cart, they will count. Thanks so much! 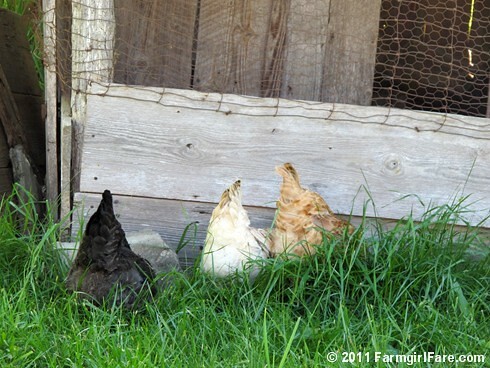 © FarmgirlFare.com, where your input is my blogging guide. What do you love the most? What would you like to see more of? Less of? Any comments, suggestions, requests? I can't wait to hear from you. 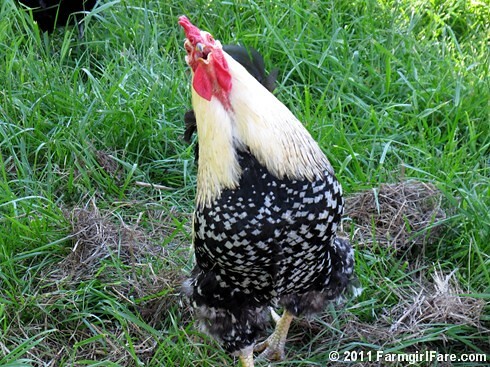 Just leave a comment below, chime in on the Farmgirl Fare Facebook page, or e-mail me: farmgirlfare AT gmail DOT com. Thanks so much for the warm welcome on Facebook! The Farmgirl Fare Facebook page already has over 1,000 fans. It's fun to hear from so many of you over there, and I really appreciate your spreading the word about Farmgirl Fare and In My Kitchen Garden (where I write about my organic heirloom garden and greenhouse). I announce each new Farmgirl Fare and In My Kitchen Garden post on the Facebook page, usually with a chatty little intro, so following along via Facebook is an easy way to keep up with what's happening here on the blog. I also share timely links to seasonal recipes and gardening posts from the archives that I think you might find interesting and helpful. Are you on Facebook? Let's connect! He's a Donkey Doodle Dan-dy! Just getting to know our Dan? Start here. Want to get to know him a whole lot better? Go here, and here, and here, and here. 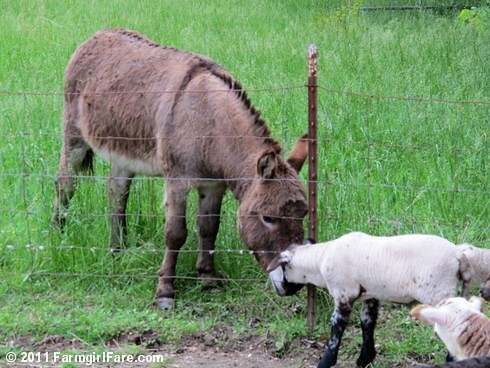 The Daily Donkey 116: How big is a donkey ear? Big enough to hide a big dog. 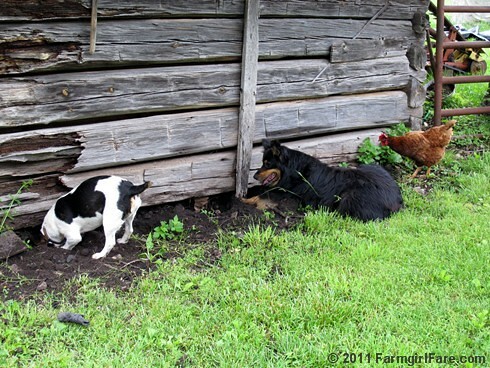 © FarmgirlFare.com, where Dan loves lambs—except when they threaten his treat time. Just joining us for lambing season? All the 2011 babies have been born, but they'll still be little for a while. You can catch up with all the cute here. 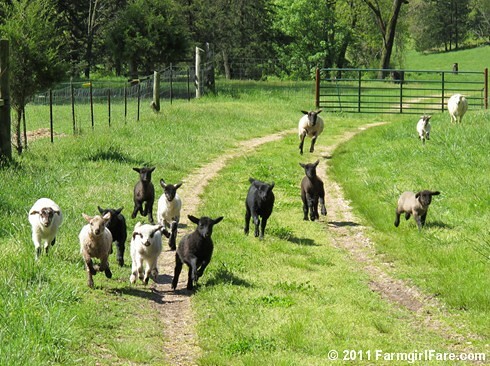 © FarmgirlFare.com, where sometimes a mama sheep or two can't help but join in the fast lamb fun—and it's been so hot and humid I'm pretty sure we're all growing gills. Hello, summer in Missouri. Somebody please send us a cool breeze—or any breeze!